Im Zeitraum vom 06.01.- 13.01. 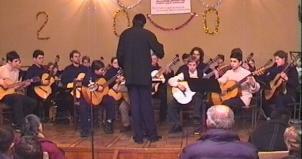 2004 eine Konzertreise nach Tiflis / Georgien. Die Reise hatte als Ziel die musikalische (und persönliche) Begegnung von Gitarrenschülern der Städte Tiflis, Tübingen und Heidelberg . 1) ein "Begegnungskonzert" (Saal der Musikschule) bei dem sich die drei Ensembles bei einem gemeinsamen Auftritt einander und der Öffentlichkeit vorstellten. Zielgruppe waren vor allem Kinder und Jugendliche der Musikschule Tiflis. 2) ein "Workshopkonzert" In gemeinsamen Proben wurden sowohl von den Georgischen Kollegen als auch von den Deutschen Ensembleleitern mit allen (Georgiern und Deutschen) Stücke erarbeitet werden, die dann in einem konzertanten Rahmen (Saal der Musikschule) aufgeführt werden sollen. Die proben werden öffentlich sein und können kommentiert werden. Ziel ist es die jeweils unterschiedliche musikalische Tradition so auf unmittelbare Weise kennenzulernen. Zielgruppe: wie oben + Fachleute, die sich für Ensemblearbeit interessieren. 3) "Studiokonzert" im Saal des Konservatoriums. Das Programm wird sich zusammensetzen aus Beiträgen des Tübinger Gitarrenensembles, von GuitArt .- Heidelberg und vom Duo - Kvaratsskelia. Dieses in Deutschland lebende Gitarrenduo wird teilweise solistische Aufgaben beim Repertoire (Haydn) von GuitArt übernehmen, aber sie werden auch einen kurzen reinen Duobeitrag spielen. Zielgruppe: Konzert für die Öffentlichkeit und Fachleute. Da das Duo in Georgien bereits einen hohen Bekanntheitsgrad hat ist auch deshalb schon ein reges Publikumsbeteiligung zu erwarten. Durch diese drei Betätigungsebenen erwarten wir, eine möglichst breite Zuhörerschaft, im Studiokonzert auch die Medien interessieren zu können. Die Deutschen Jugendlichen werden in Georgischen Familien untergebracht sein. Dadurch ist ein sehr direkter Bezug zu den dort lebenden Menschen von vorneherein gewährleistet. Die musikalischen Aktivitäten werden also auf 3 ebenen stattfinden, die ebenfalls den internationalen Jugend - Begegnungscharakter als zentrales Anliegen erkennen lassen. Neben der musikalischen Begegnung sind auf jeden Fall auch gemeinsame Freizeitaktivitäten (noch zu konktetisieren) und ein Abschlußfest vorgesehen. On January 12, the Small Concert Hall of the Tbilisi Conservatoire received guests from Germany. These were the young guitarists enlisted in two different musical groups: GuitArt (Heidelberg) and Tubingen Ensembles. 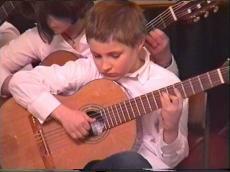 The project, sponsored by the Goethe Institute, was the idea of two outstanding young Georgian guitarists, the brothers Nicka and David Kvaratskhelia. They received their musical christening in their early childhood, from the age of 6 and delivered their first concert in a duet of guitars when they were nine. In 1996 the brothers continued studying in the High School of Frankfurt. In February 2003 they finished the post-graduate studentship with the highest degrees and entered the Weimar High School named after Perenz Liszt, at the concert department. In 1998 the Kvaratskhelia duet was rewarded with the first prize and the title of Laureate at the 11th international contest of guitar duets. Lastly, in 2003, they got the second prize and a special audience award in a musical content held in France. The musical delegation consisted of more than 25 people. The only Georgian members of the group were the organizers of this project, Nicka and Dato Kvaratskhelia. With the financial support of the Goethe Institute, they were able to invite the young German guitarists aged from eight to 20 (some older) and put them up with Georgian families. It was apparently the first case when Georgians voluntarily received so many foreign guests - the members of two orchestras. GuitArt is an ensemble that became the winner of the 4th Orchestra Contend of Germany in 1996, the members of which are the most gifted young guitarists of Heidelberg and its surroundings aged 15-20. It was founded in 1991 by Helmut Oesterreich. Their repertory is quite rich, comprising every epoch like Renaissance music, the orchestra transcriptions of Per Giunt by Edward Grieg, as well as contemporary music. Interpretations of jazz and pop songs are also the components of their musical program. GuitArt had tours in Ukraine in the Crimea International Guitar Festival, and in Bulgaria, Hungary and Turkey. Mandy Bahle, a young pleasant-looking woman, the conductor of the Tubingen (a small town near Stuttgart) Ensemble, who, together with Helmut Oesterreich, played a role as the leader of this trip, was very frank and unreserved in expressing her emotions before the concert: Its very interesting for us to be in Georgia. People are so friendly and welcomed us so much. Im excited as its the first concert abroad for my ensemble. As for myself, Ive been working for five years now and must say that this job is my great devotion. I want to pay thanks for all the Georgians involved, particularly the Georgian parents who received our musicians in their homes. Theyre likely to go back to Germany with three kilos more by virtue of the tremendous hospitality and generous treatment of Georgians. Id also like to thank heartily Nicka and Dato for such a successful job theyve done in organizing all these activities. Dato Kvaratskhelia, who, like his inseparable brother, was obviously very happy to have a chance to play on the native stage of Georgia, said: The idea came from both sides. Helmut Oesterreich, the conductor of the Heidelberg Ensemble of guitarists called GuitArt, who had organized many similar concerts in the past years, offered to arrange concerts in Georgia. We gladly accepted this suggestion. Luckily, everything ended well by means of the support of our Georgian guitarists. Its an exchange program and if we manage, wed like to implement the same project in Germany, sending young Georgian guitarists. Nicka Kvaratskhelia, who looked content after the second part of the concert seeing the concert hall full, told Georgia Today: It was because of our acquaintance with Mr. Oesterreich that it was decided to come to Georgia. Otherwise these ensembles might well have gone to another country, as it was initially implied in the project to send these young people to one of the Eastern European republics. I think that the cultural exchanging took place. The Georgian families got acquainted with German children and adolescents and the latter had the first chance to penetrate into Georgian folk music. To the program that was defined before arriving, some additions were made. We learned from Nicka that the German side was interested in playing something out of Georgian folklore. The Georgian party selected Suliko, the famous song written to a marvelous rhyme by the most honorable Georgian poet and writer, Akaki Tsereteli. Besides, there was outstanding music from the series of James Bond, which was performed in the appropriate spirit. The conductor fetched a pair of dark black spectacles especially for this musical item. The young German musicians feel really pleased with the week that, in accordance with their words, was full of warmth and welcome. Georgia Today spoke to the eldest member of the Heidelberg Ensemble GuitArt. Michael Zeuner, its representative, who told us: Were really delighted by the hospitality. It was incredible, something we never expected. At this concert well be playing some Avant-garde music. I think it was really interesting for both sides, as we presented ourselves and the German conductors delivered master classes for the Georgian students, and arranged a workshop on musical theory. Another guy from GuitArt, Andreas Bittner, said: Thanks to Nicka and David we were able to come to Georgia. We were informed by them that Georgians were keen on guitar playing, and especially curious about the guitar orchestras which is a rarity for Georgia. Were extremely pleased as normally when staying in hotels we doesnt get an opportunity to get inside the culture of the host country. But if you are in a family, its perfect, as youre tasting the national food, you learn some peculiar traditions, get to know how to behave in the society that is not usual and well-known for you. Its a pity that our visit is coming to its end. In the second act Nicka and David played the solos of the concert Do Major by Ioseph Haydn. Seven young Georgian musicians  five guitarists and two flutists  joined their German colleagues. Two more concerts were held: one in the premises of the Tbilisi Musical School 2, another in Tskneti. The last show of January 12, held in the Conservatoire, which was free like the other two, was held in an atmosphere full of warm applauses. The variations from James Bond and Suliko, which topped the festive evening, were the climax of the whole show. Eine Konzertreise des Tübinger Gitarrenensembles zusammen mit der Heidelberger Gitarrencrew und GuitArt Heidelberg. Unsere Reise begann am Dienstag 7. Januar 2004 in Tübingen an der Musikschule, wo wir zu siebt einen Reisebus bestiegen, um, mit kurzem Zwischenstop in Heidelberg, nach Frankfurt zu fahren. Nach einiger Wartezeit, der Bus war gut durchgekommen, konnten wir in Flug A9 622 von Airzena einchecken. Abflug 19:20 Uhr, vier angenehme Stunden Flugzeit quer durch Europa bis wir um 2:30 Uhr Ortszeit in Tiflis landeten, an einem Hauptstadtflughafen, der die Größe eines deutschen Regionalflughafens hat. Vor dem Flughafen wurden wir von unseren Gastfamilien, die alle vollständig da waren, abgeholt. Eine Fahrt über schlaglochübersäte Straßen, ließ uns schon erahnen, dass uns unsere Konzertreise in ein sehr armes Land geführt hatte. Dies bestätigte sich beim Anblick der Wohnhäuser, die sich in einem für uns unvorstellbaren Zustand befanden, überall bröckelnder Putz, graue Außenwände, zerbrochene Treppenstufen. Als Ausgleich dafür erfuhren wir aber von Anfang an liebevolle Gastfreundschaft, die sich in nächtlichem Tee mit frischen Früchten zeigte. Glücklicherweise konnten Sprachbarrieren schnell überwunden werden, da alle Gastfamilien englisch oder sogar deutsch sprachen. Am nächsten Mittag war die erste Probe angesetzt worden und wir kamen in den Genuss der vielfältigen georgischen Transport-Systeme, uns wurde gleich klargemacht, dass es sich hier eher um Transportchaos handelt, um die Musikschule, die sich ein wenig außerhalb des Stadtzentrums befindet, zu erreichen. Das Hauptverkehrsmittel sind kleine Lieferwagen, meist von Mercedes, die mit vielen Sitzen bestückt als Busse fungieren; sie können zum Ein- und Aussteigen überall entlang ihrer Route angehalten werden. Außerdem sind Linienbusse, Oberleitungsbusse, Straßenbahnen, U-Bahnen und weiße Taxis im Einsatz. Zwischen all diesen Verkehrsteilnehmern, vermischt mit vielen PKWs, fuhren wir einzeln, begleitet von Gastgebern, mit leicht überhöhter Geschwindigkeit und bei undurchsichtigen Verkehrsregeln durch breite baumbestandene Straßen. Die Musikschule, die sich bautechnisch in keinem besseren Zustand befand als die Wohnhäuser, stellte sich als recht frostig heraus. Vor und nach der Probe wurden schon die ersten Erlebnisse zwischen uns Gitarristen ausgetauscht, sodass darüber der Nachmittag verging. Den Abend verbrachten alle mit ihren Familien. Teilweise spielten auch die georgischen Gastschüler Gitarre, sodass sich die Möglichkeit des gemeinsamen Übens ergab. Am nächsten Morgen, Donnerstag der 8., war wieder eine gemeinsame Probe in der ein wenig geheizten Musikschule, das Mittagessen dann in den Gastfamilien. Um um 16:00 Uhr wieder in Konzertkleidung in der Musikschule zu erscheinen und ein Konzert vor vollen Reihen zu spielen. Die georgischen Eltern waren begeistert. Als Abschluss des Tages gingen alle, auch die georgischen Gitarristen und die beiden Querflötistinnen, die zusammen mit uns die Eröffnung und die Zugabe spielten, in ein Bistro in der Stadt, offensichtlich sehr edel für dortige Verhältnisse, da neu gebaut und sehr sauber. Bis um 22 Uhr wurde bei guter Stimmung geredet. Mit Tilla, einer Schülerin aus Heidelberg, die russisch kann, unterhielten sich auch die Georgier fließend (was diese besonders begeisterte). Freitag der 9. war unser freier Tag, wir hatten schon am Vortag verabredet, uns um 12 in der Stadt zu treffen, sodass sich die meisten deutschen Schüler zusammen mit ihren Georgiern um 12:30 an der Oper trafen. Unter der Führung eines Gastgebers wurde uns, obwohl die Vorstellung bereits begonnen hatte, das Innere des Opernhauses gezeigt. Die Tour ging zu Fuß weiter, zu der wichtigsten der vielen Kirchen, die es in Tiflis gibt, vorbei am Parlamentsgebäude, die Hauptstraße hinunter und hinein in die Altstadt mit ihren, zum Teil von Erdbeben beschädigten, alten Gebäuden. Uns wurden Teile der Stadtmauer und neu hergerichtete Straßen gezeigt. Dann bestiegen wir den Burgberg, der mitten in den Talkessel ragt, und genossen die Aussicht von dort oben. Zurück ging es auf anderen Wegen zur Oper, von wo aus Frau Bahle, die den Tag über im Konservatorium Meisterkurs gegeben hatte, zwei Schülerinnen zu einem Interviewtermin mit dem Rundfunk mitnahm. Obwohl die Stadtführung bereits 4 ½ Stunden gedauert hatte wären wir gerne noch ins Kulturhistorische Museum gegangen, doch das hatte leider schon geschlossen. Der nächste Morgen war sehr frisch, die Probe war ursprünglich wieder in der Musikschule geplant, dann aber ins Konservatorium verlegt. Direkt danach ging es, in einen Kleinbus gestopft, aus Tiflis hinaus in ein kleines Dorf, wo wir ein Konzert in einen ehemaligen Theater haben sollten. Als wir ankamen war der Raum eisig. Kurzerhand wurde das Programm gekürzt, auf Konzertkleidung verzichtet und ein Aerobicprogramm gestartet. Das Publikum klatschte wie wild, war aber leider undiszipliniert, für uns alles sehr ungewöhnlich. Nach unserer Aufführung und dem Auftritt mehrerer Gitarristen aus Georgien bedankte sich die anwesende Kulturministerin von Abchasien ausführlich. Dann aber kam der zweite Teil des Programms, georgische Folklore. Zuerst Gesang und ****, ein traditionelles Saiteninstrument und dann eine Tanzgruppe, deren Können laut den Organisatoren nur unteres Mittelmaß war, was wir aber nicht glauben wollten, denn diese Jugendlichen legten eine wahnsinnige Show hin, in einer Geschwindigkeit und Gekonntheit, die keiner von uns je gesehen hatte. Nach diesem Highlight waren wir alle bei einer der Gastmütter eingeladen, in deren winzigem Haus wir zwar eigentlich keinen Platz hatten, aber doch einen fanden. So klang dieser Abend im holzofenbeheizten Küchenhäuschen mit Gesang von Georgiern und Deutschen aus. Der Sonntag war als Ausflugstag geplant. Wir trafen uns alle am Konservatorium und bestiegen den Reisebus, der zu diesem Zweck organisiert wurde. Die erste Station war eine Kirche in Tiflis aus dem 5. Jahrhundert, die uns wieder von gut vorbereiteten Gastgebern erklärt wurde. Dann ging es aus Tiflis hinaus, nach Mtskheta (=Mcheta? Nördlich der Hauptstadt). Dort zeigte man uns zuerst eine uralte Kapelle auf dem Berg, von wo aus man eine wunderbare Sicht über den Zusammenfluss zweier Ströme und ihre Täler hatte. Auch der Kaukasus war in der Ferne zu erkennen. Mit dem Bus fuhren wir hinunter in die Stadt und uns wurde die sehr schön geschmückte, hohe Kirche gezeigt, die laut unseren Führern uralt ist. Auch die Mythen, die sich um diese und die Kapelle auf dem Berg ranken wurden uns erzählt. Das Mittagessen wurde in einer echt georgischen Wirtschaft eingenommen, in Form von verschiedenen sehr schmackhaften einheimischen Gerichten. Gut gesättigt fuhren wir zurück nach Tiflis, wo wir den Berg, auf dem sich der Fernsehturm befindet, erklommen. Die Standseilbahn, die früher die Verbindung herstellte ist schon lange außer Betrieb. Von dort oben konnten wir das erste Mal die wahren Ausmaße der 1,5 Millionenstadt ausmachen. Im Sonnenuntergang wanderten wir hinab. Montag, und damit der Tag unseres großen Konzerts. Am Vormittag wurde noch einmal gründlich geprobt. Doch danach gab es die Möglichkeit noch die paar Schritte in die Stadt zu gehen und die billigen Preise zu nutzen. Auf der Straße trafen wir mehrere Georgier, die hörten, dass wir deutsch sprachen und da sie auch deutsch sprachen ein Gespräch mit uns anfingen. So zum Beispiel ein Professor der georgischen Diplomatie, der lange Jahre in Deutschland gelebt hatte. Sie waren hoch erfreut als sie hörten zu welchen Zweck wir das Land besuchten und boten uns sogar an uns zu führen und zu dolmetschen. Doch wir lehnten dankend ab und luden sie zum Konzert ein. Mit Schnäppchen beladen kehrten wir zu den letzten Vorbereitungen ins Konservatorium zurück. Das Konzert, das vom Fernsehen mitgeschnitten wurde, fand im stuckgeschmückten Konzertsaal statt. Mehrere Stücke wurden in verschiedenen Zusammensetzungen, zusammen mit Nick und David, dem begleitenden Gitarrenduo, und von Solisten vorgetragen. Hier waren die Zuhörer auffällig diszipliniert, sie klatschten nicht zwischen den Teilen eines Stücks. Besonders die Auswahl und Vielfältigkeit des Programms begeisterte sie. Nach diesem Erfolg fuhren wir zu einem Restaurant um den Abschluss der Woche gebührend zu feiern. Wein wurde in großen Krügen serviert und nachdem schon alle satt waren kamen immer noch Gerichte, die Stimmung war prächtig, den Organisatoren in Georgien wurde Dank ausgesprochen und Geschenke überreicht. Bis um 1:30 wurde so gefeiert. Nachdem am nächsten Morgen alle gepackt hatten traf man sich wieder am Konservatorium um gemeinsam zum Flughafen zu fahren. Die Familien verabschiedeten sich herzlich, ein Wiedersehen ist fraglich, da ein Visum für Georgier nur schwer zu erhalten ist. Trotz heftigem Schneefall konnte die Maschine sicher starten und wir flogen dem Sonnenuntergang hinterher zurück nach Deutschland, wo wir von einem Bus abgeholt wurden und, über die erlebnisreiche Woche diskutierend, über Heidelberg nach Tübingen zurückfuhren. Unbeschadet und voll neuer Erfahrungen und Erlebnisse kehrten wir als eingeschworenes Team zurück.